(Sponsored post) Black, red and yellow highlight the latest G-SHOCK 35th anniversary commemorative watches that comprise its evocative Magma Ocean group. 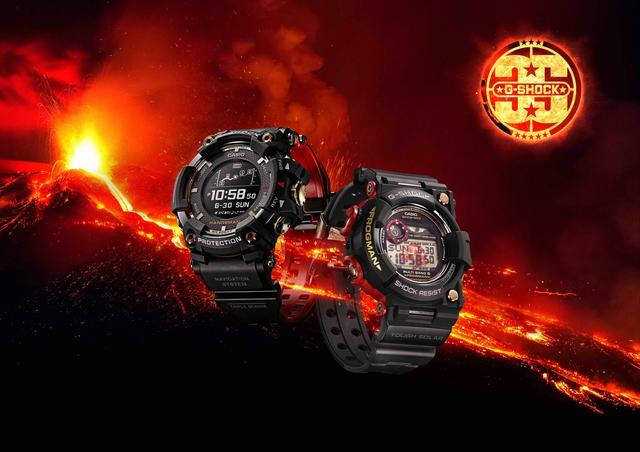 This collection, named to recall the earth’s volcanic origins, looks back to the groundbreaking origin of the G-SHOCK brand—declaring a firm commitment to new G-SHOCK value for years to come. These two new Magma Ocean watches feature the symbolic black G-SHOCK brand color and red as base colors, highlighted with the brilliant rose gold and yellow gold G-SHOCK has been using to celebrate the 35th anniversary. Two of the base models are the RANGEMAN GPRB1000TF-1, which is designed for the ultimate in survival toughness, and the FROGMAN GWF1035-1, a diver’s watch that continues to evolve. G-SHOCK introduced the first FROGMAN watch in 1993. To mark the 25th anniversary of FROGMAN in 2018, the familiar FROGMAN icon featuring a stylized frog is found throughout the FROGMAN GWF1035F-1, both obviously and subtly placed. Users will enjoy trying to find all of the FROGMAN icons on the watch. Both models feature a case back engraved with a logo that identifies them as 35th anniversary models and they all come in a commemorative package. The G-SHOCK Magma Ocean collection is available at selected G-SHOCK retailers including Macy’s, G-SHOCK Soho Store, and gshock.com. Click here to learn about G-SHOCK's collections.